The Flats Roller was created specifically as a Reaction Lure to target Big Bass on lake flats but can be used on many other species, including Yellowbelly, Cod, Redfin, Saratoga & Sooty Grunter. 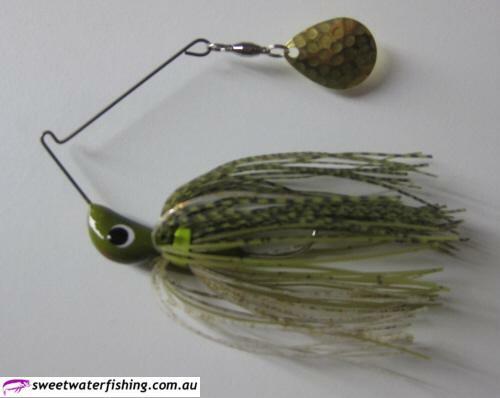 Developed on Queensland’s Big Bass Lakes over several years by Garry Fitzgerald (BASS Electric Final - Biggest Bag Record Holder), the Flats Burner has a proven pedigree for catching Big Bass. The intent of this range of spinnerbaits to give the widest effective application possible in a spinnerbait, the end result is a balanced weight : resistance range that makes it easy & effective to fish with. Made with a heavy head for long casts and down sized blade. The Flats Roller is ideal for covering country while staying in constant contact with the bottom. The Flats Roller can be fished slower than the Flats Burner and can hopped or jigged across the bottom when the bite is slower or fished faster for a reaction strike. Handmade spinnerbaits proudly made in Australia.